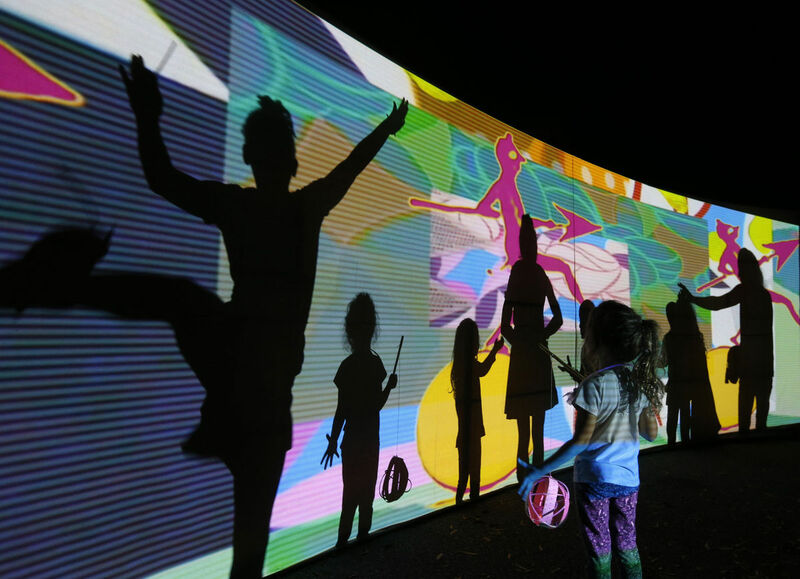 FSU Art Assistant Professor, Clint Sleeper, and Assistant Teaching Professor Chalet Comellas collaborated with musician Mark Baker to create an interactive video installation that was selected for InLight Richmond. The exhibition took place Friday, November 3. Organized by 1708 Gallery, InLight Richmond is a public one-night exhibition of light-based art and performances. The event offers the community an opportunity to engage with contemporary art outside the gallery walls and to experience the city in new and unexpected ways. This year’s selection of works was juried by Nat Trotman, the Curator of Performance and Media at the Solomon R. Guggenheim Museum, where he oversees the museum’s collection and presentation of time-based artworks, including performance, video, film, sound, and other media. Reviewing the submissions for this year’s edition of InLight, I was impressed by the number of immersive artworks that were proposed, and by how many featured strong performative musical and interactive elements. In an era when we absorb so much light in solitude, engrossed in the illuminated screens of our phones, computers, and televisions, it is heartening to see artists taking the medium back into the public sphere. Unfurling down the storefronts of West Broad Street, these environmental installations may recall the pavilions of the Electric Carnival, staged in the same area in 1901- another moment of rapid technological change and social upheaval. Even as they explore a vast array of subjects, formats, and styles, together the artists featured in InLight foster the possibility of a new communal experience, based in a radiant, illuminating celebration of light itself. “Feverous Transgressions” alludes to a history of the moving image, particularly circular pre-film devices like the zoetrope. On the screen, video collages are constructed and deconstructed, referencing a history of the carnivalesque, early film and animation, drawing on theories posited by Mikhail Bakhtin. Interactive digital software triggers shifts in the animation and the audio composition. As viewers gather before the moving image, the gentle dance of imagery grows feverish and liberated, transgressive and radical, as Bahktin imagines the carnival. The audio collage – consisting of carnival stems, digital synthesizers, and found sounds – swells correspondingly, moving across the speakers as viewers gather. Video clips race around the curved screen, an accelerated animation, until the viewers are bathed in flashes of light. The meaning of the image, of the waltz, of the machine, is lost; instead, it means everything that we are standing together in front of it.